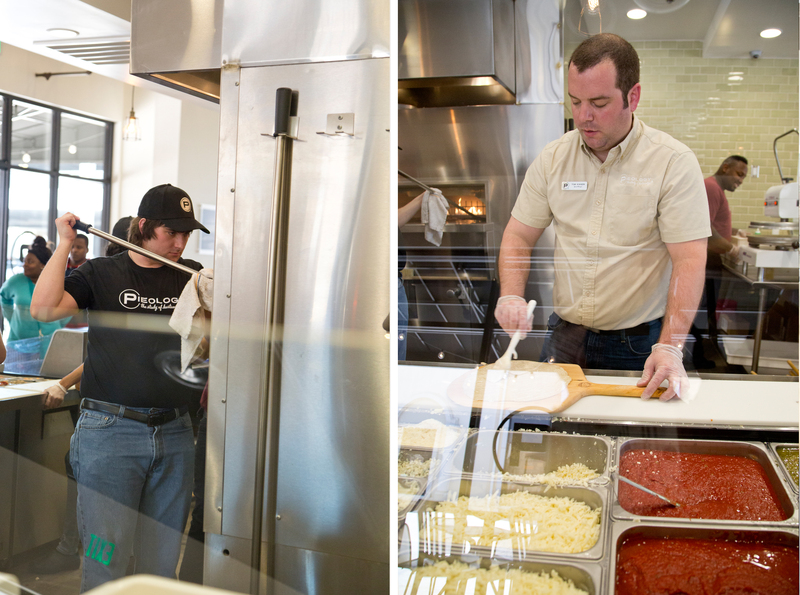 Bridge Street Town Centre (in Huntsville, AL) has a pizza place! And it is delicious! 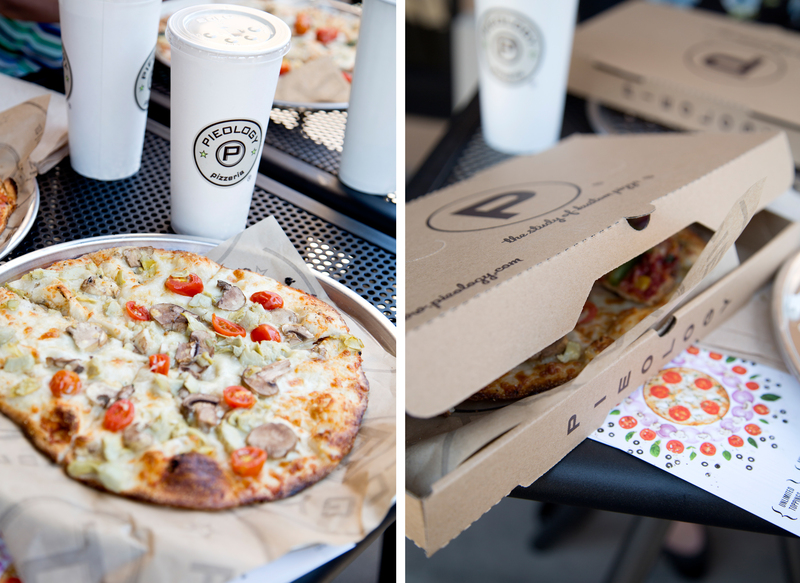 I was cordially invited to Pieology’s Media Event (Thank-you Tim!) 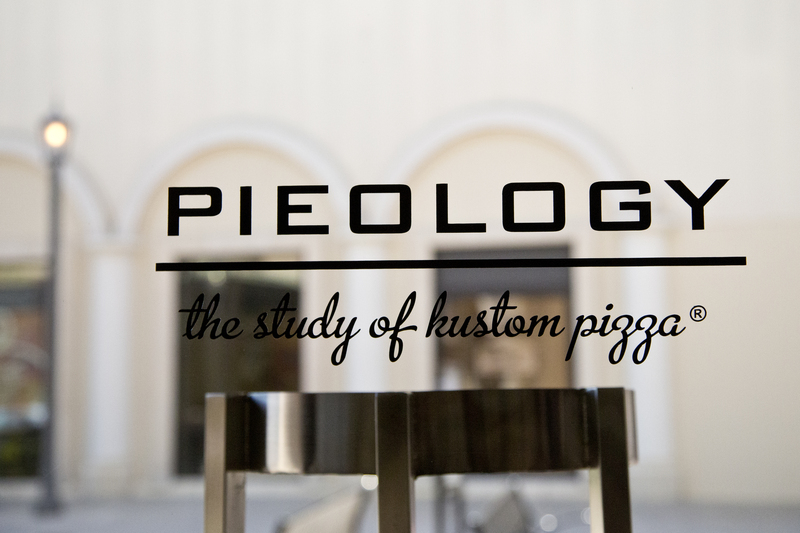 and got a sneak peek at the restaurant, met the talented staff, and, best of all, got to sample their delectable pizza. 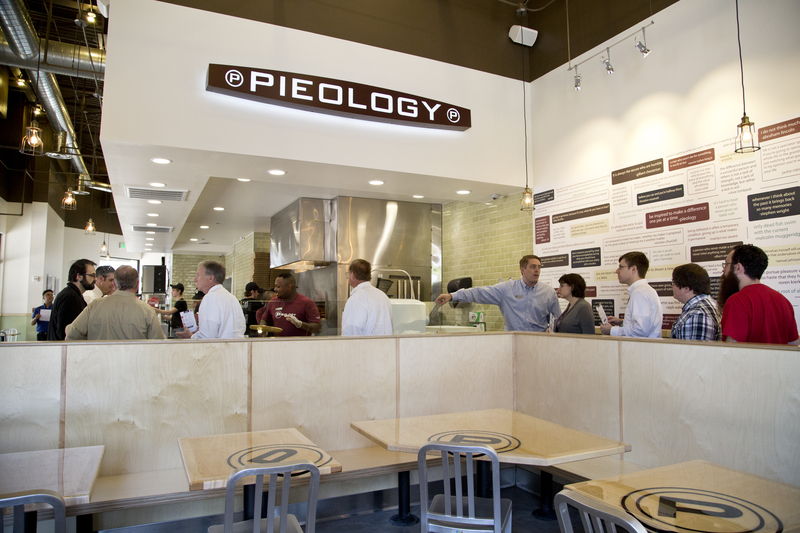 Pieology Pizzeria originally started out west with the goal of creating fresh, customizable pizzas at a good price. 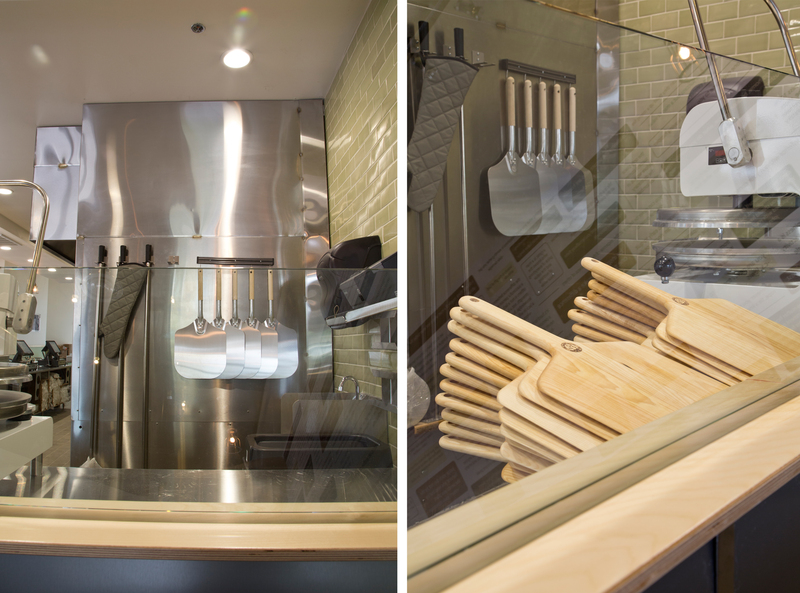 Finally they’ve come to the south and we too can enjoy great ingredients, friendly service, and a fun experience. Happy people waiting for pie! I attended the event with my husband. I took a photograph of him waiting in line with me as evidence, but he got annoyed that I was taken too long to take the picture and made a stupid expression at the last second. I should have posted the photo anyway (serves him right) but being the loving and benevolent wife that I am, I deleted it. The line was long, as everyone was excited to sample the fare, but we got through quickly. Plus there is a giant quote wall along the line path, so you are entertained/inspired while you wait. After several minutes of inspirational quote reading we were ready to order. A super friendly employee (I’m so sorry I forgot your name) explained our different crust options and put the fresh dough in a pizza press for a nice thin crust. He was very nice so I feel terrible that I can’t remember his name. I guess I was just too excited about the pizza. You can see my husband’s reflection in the bottom left of the photo. Sadly, that is the only decent shot I got of him at the lunch. We then picked from one of seven different sauces. You an even mix and match them! I was completely uncreative and just went with the pre-designed Alfredo’s Alfredo pizza, but it was delicious, so I was happy with my decision. My hubby chose the Rustic Veggie. 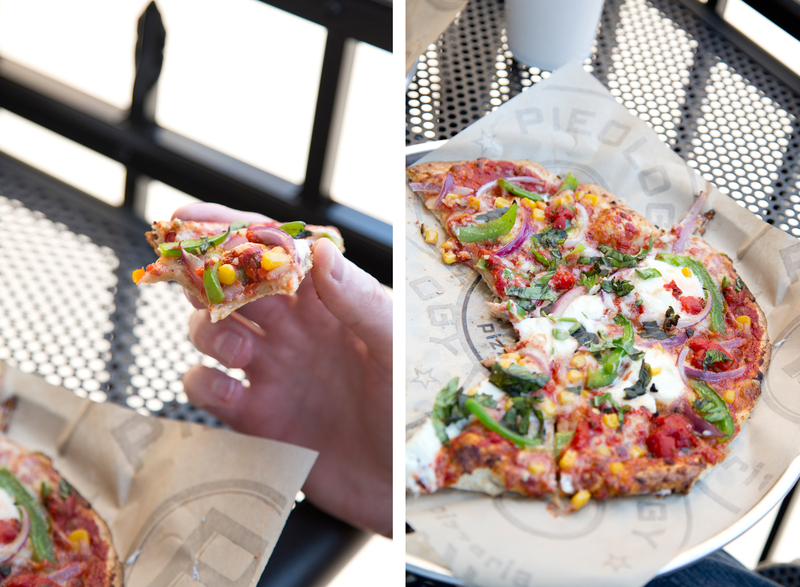 We planned to swap a couple of slices so we could try both, but we forgot. Oops! Guess we’ll just have to go back. 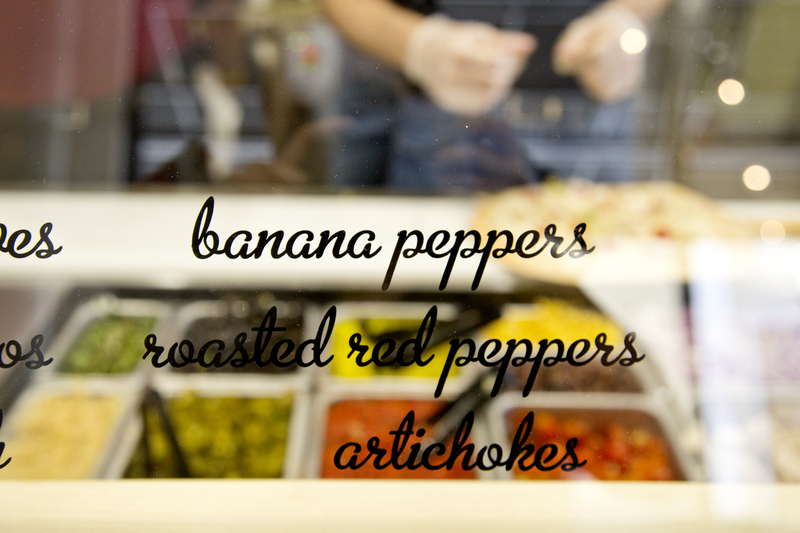 Then we picked our your cheeses and toppings. Again, I just defaulted to the menu item, but I think I’ll get creative the next time. 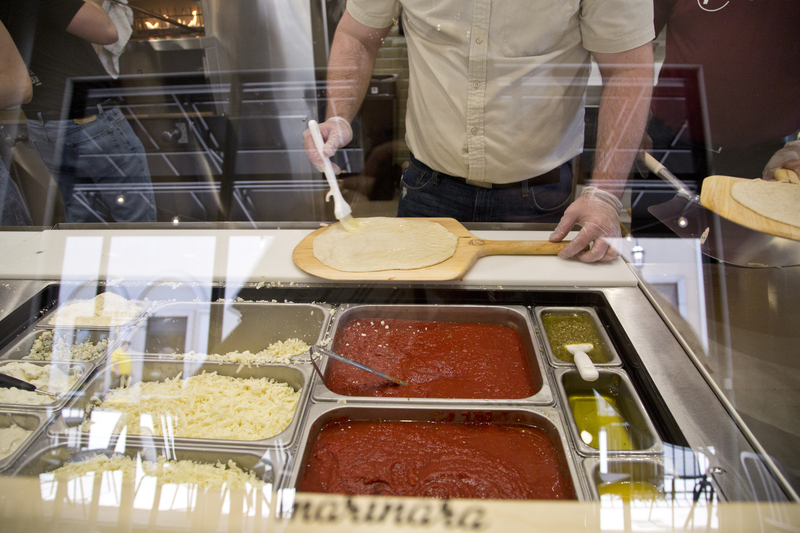 The great thing is that every pizza is only $7.95 no matter how many toppings you get on it. Everything is fresh as well. I was told they don’t even have freezers so you know you’re getting fresh food that is produced on site. 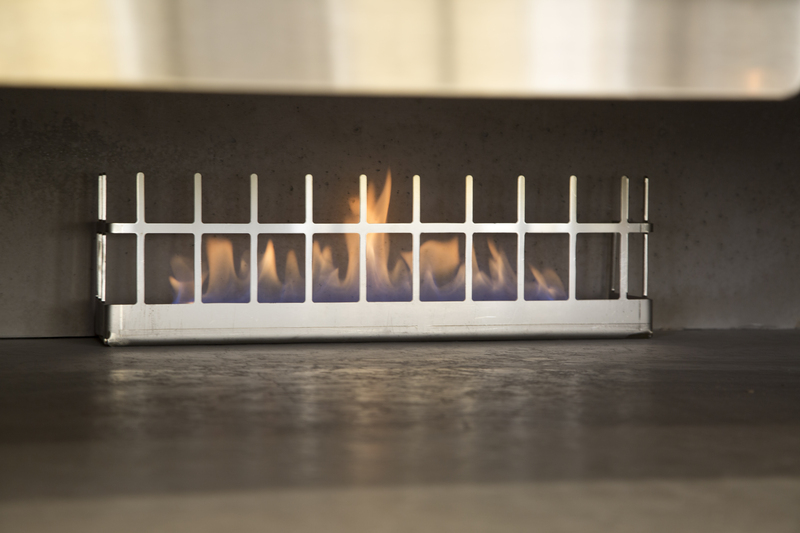 This is inside the oven where all the magic happens! Manager Tim is on the right. Say hey to him when you go in for a visit. He is very helpful and nice. After we picked out our toppings the pizza went into the oven to cook for 3 minutes. We got our drinks. There were 4 sweet tea choices so southerners will be happy. And the tea was good, none of that canned nonsense which will remain nameless. True southerners will know what I’m talking about. We waited in the patio area for a very short time and Volia! yummy pizza goodness. Looking at the photo I just realized that I did not follow the instructions of the number sign and place the sign at the edge of the table. It was pretty much in the middle, which is the opposite of the directions. Oops! I’ll know for next time. I am looking forward to my next visit. 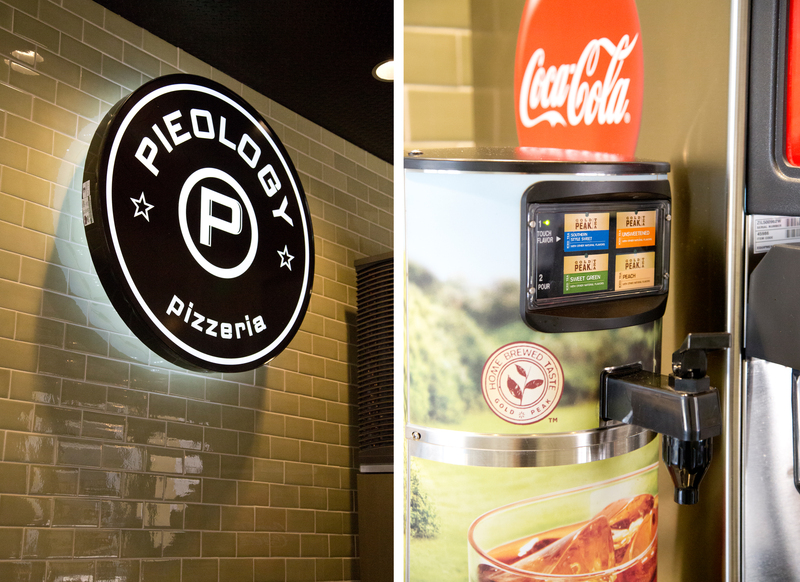 Thank-you Tim and the staff of Pieology for inviting me for the sneak peek. Congratulations on your grand opening today (April 23rd). Make sure y’all like them on Facebook to keep updated on any upcoming events! 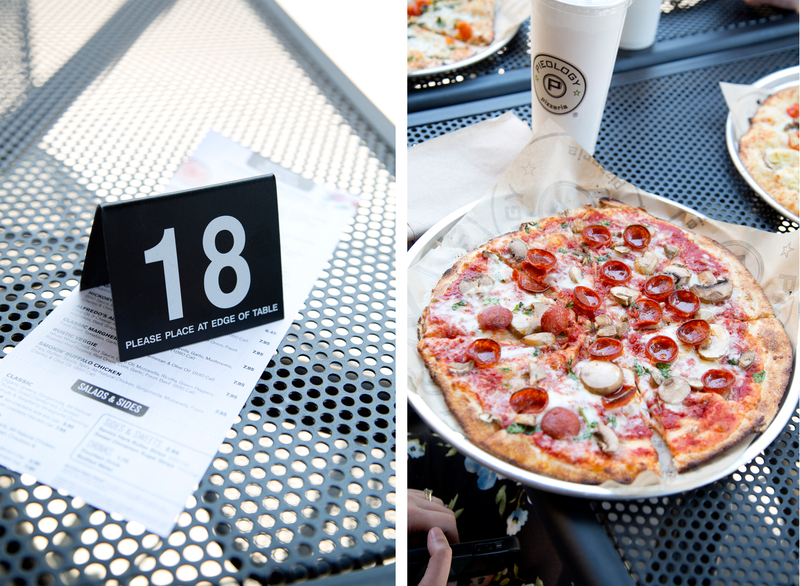 Categories: Food Review | Tags: bloggers, eat local, food bloggers, fresh, huntsville alabama, ihearthvs, italian food, pieology, pieology pizzeria, pizza, sarah belanger violet henri, thejealouscrumpet, toppings | Permalink.